from the delivery date of this Employment notification, and 28 days for the candidates belonging to Islands(Andaman & Nicobar, Lakshadweep), Ladakh of J&K, Lahaul & Spiti District and Chamba District of Himachal Pradesh 37 days from the notification given date. Indian Ministry will select eligible candidates based on Physical Endurance Test(PET), Written Test followed by Practice Test. Other eligibility and vacancy details, Selection Process, Qualifications for Indian Army 313 COY ASC Supply Type - G Recruitment 2017 are given below. Total Available vacancies: 102 posts. Name and no. of vacancies. General category candidates age limit is: 18yrs-25 years. For OBC category candidates: 18yr – 25 years. For ST/SC Category candidates: 18yrs – 30 years. 5 years of Age relaxation is available for Domiciled citizens of Jammu & Kashmir as per Indian government orders. Candidates will get monthly salary Rs.5200/- to 20,200/- plus Grade Pay of Rs.1800/- to Rs. 1900/-. 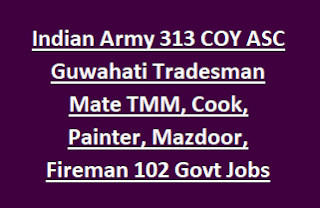 For Safaiwala, Tradesman Mate, Fireman posts qualification is Matriculation/ Equivalent from a recognized Board. Candidate who is applying for fire man posts must be physically fit and should know the basic principles of fire fighting methods, First –aid fire fighting appliances etc. Must served minimum of 3 years as Fireman Grade II in a recognized civil Fire brigades. Candidates are required to appear for following tests. 1. Physical Endurance Test: Consists Running, Chin Up, Bent knee sit up, Fire man lift). 2. Written Test : will Comprise 4 parts ,it covers Numerical Aptitude, General Intelligence and Reasoning, , General English and General Awareness. Time duration is 2 hrs. Candidates fill and submit their applications with required documents and photo copies of certificates to the given address within 30 days from the notification given date. Do not submit Original certificates with the Application form. Painter post keliye tho koi running nahi diya notification pe. Lekin painting practical test tho hoga. notification link pe click karo uspe sari details he running ki bare me. Painter ko nahi diya endurance test pe. Exam tho hoga..